Police across China are bursting into the homes of Falun Gong practitioners and forcing them to give blood samples in order to set up a DNA database, said a report published last week on a human rights website. The police are believed to be doing the testing in order to expand the list of potential donors whose organs may be taken for forced harvesting. A July 19 article on the Falun Gong-run website Minghui.org lists over 25 incidents, some involving as many as 10 practitioners, in Liaoning, Guizhou, Hebei, and Hunan provinces, as well as in Beijing. These provinces are dispersed geographically, stretching from the far northeast of the country to the southwest. The testing done was consistent with determining someone’s suitability as an organ donor, according to Bloody Harvest. Nonpractitioners held in the camps were not chosen for these expensive tests. Kilgour and Matas listed this testing as one piece of evidence supporting the conclusion that practitioners detained in China were being used as a live organ bank. In a phone interview, Matas volunteered that he had never before heard of practitioners who were not in detention having their blood drawn. “These tests are presumptively for organ harvesting, unless the authorities provide an alternative explanation, which they haven’t done,” Matas said. Ethan Gutmann, the author of the forthcoming book The Slaughter: Mass Killings, Organ Harvesting, and China’s Secret Solution to Its Dissident Problem (Prometheus Press) had also never heard before of testing done on practitioners not in detention. Gutmann links the testing to the decision this spring by the Chinese regime not to stop using the organs of executed prisoners. Chinese officials had earlier announced the establishment of a volunteer organ donation system that would take the place of using prisoners’ organs. Matas speculated that this new tactic for gathering practitioners’ data might be linked to the shutdown of the labor camps in China at the end of 2013. According to the July 17 Minghui report, officers from a police station in the city of Weining, Guizhou Province, told practitioners the blood samples were being used to set up a DNA database. In other Minghui reports, practitioners have reported having officers forcibly swab their mouths in order to take DNA samples. In one case, officers went into the home of a practitioner who was missing and collected DNA off of his personal effects. Gutmann noted that the testing used in China to check organ viability has evolved from extensive medical testing to the use of DNA samples. The testing described by Minghui appears to be consistent with that, he said. “DNA testing and cells from blood testing may each be used for determining if a donor is a transplantation match, but each has its limitations. DNA and cells taken from blood samples can be used for HLA [tissue] typing. Blood samples can be used to check the functional status of the donor’s organs, which needs to be done even if compatability has been determined through HLA testing. “The problem is that even if it is a scare tactic, history shows that scare tactics may become reality,” Gutmann said. 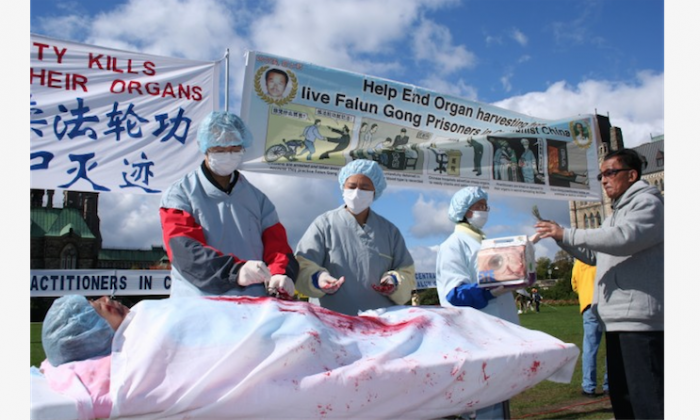 An account from China tells of how organs are harvested from practitioners of Falun Gong at hospitals there, with the help of the security forces.